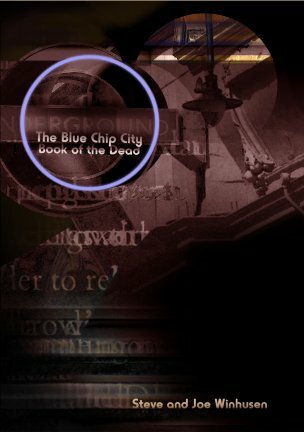 In The Blue Chip City Book of the Dead, the Brothers Winhusen (graphic artist Joe and poet Steve) have created an ironic homage to the (under)world of the contemporary quotidian, the quotidian that prepares us—or fails to prepare us—for the passage into an afterlife which may, come to think of it, exist solely in the present moment. Stunningly designed and executed, this visual/poetic collaboration is inspired not only by The Egyptian Book of the Dead but by the medieval tradition of the Très Riches Heures and the illuminated books of William Blake. The sheer range of forms and styles is breathtaking, and is all the more impressive for the grandly coherent whole into which those forms and styles merge. The ghosts of Samuel Palmer and Wallace Stevens flit through a post-Great Recession soulscape disaster: “O Dark one, No one saw it coming.” Too late: we have to follow Joe and Steve to the end of their beautiful nightmare.